This is an old experiment I did after being asked if baking soda can relax hair (that is straighten it to some extent). 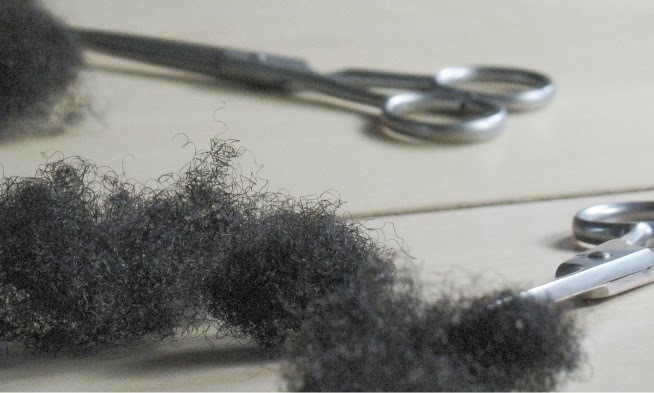 I therefore took some of my own shed hair and tested it! 1. I have two main curly strand sizes (plus some straight hair too but I didn't use this for obvious reasons). 2. I have super curly hair that pretty much coils round as you can see in the picture below. 3. For a better view, I stretched out the length loosely and picked out shed hair that matched the smaller strand size A (mostly because there was more of it). 1. I took 4 individual stands of hair and washed them in shampoo to get rid of any hair product on them (oil or conditioner). I then let them air dry. From my point of view (see the pic below), I could not see a difference between the water soaked strands and the baking soda treatment. The hair had the same curl and stretched out in the same way. The curl pattern looked the same before and after. 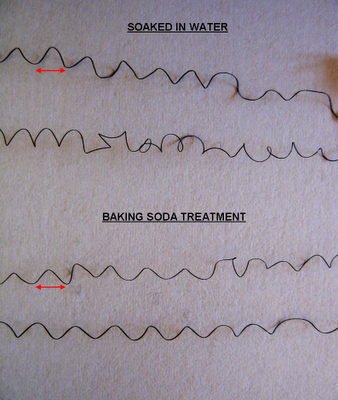 From my experiment using my baking soda (Sainsbury's brand if you are interested), there was no 'relaxing' of the curl. I think it matters that the baking soda I used had some corn starch in it (all the ones on the shelf did too). Its pH was 7-8 (as measured by me). Some people report that pure baking soda should have a pH of 9. Relaxers have a pH of 10-12. I do think people should know that the pH of the relaxer is important towards relaxing hair but more important is the ability to break the bonds of the hair. In short, I do not think that baking soda can break bonds. I think much like the coconut lime relaxer, some people are confusing moisturised hair with relaxed hair. The baking soda treatment, as I understand it, is a treatment done with a ratio of conditioner to baking soda (no water added as the solution becomes too liquidy). It sounds like what you did was a clarifying baking soda rinse. I've tried the baking soda treatment and it actually made my hair really soft and the curls stretch out a little. I don't know if you would be interested in running the experiment again because it seemed like it was a lot of work, but if you are, Little Golden Lamb has the recipe she used here (http://littlegoldenlamb.wordpress.com/2009/01/31/baking-soda-and-the-bombshell/) I hope that helps. Happy experimenting! Thanks Kanyin. I didn't use hair conditioner because scientifically, if we are saying the effect comes from baking soda, then this is what should be tested. I think hair conditioner always has this effect of making curls appear. This is the basis of Teri's method (See my links to the left). I don't really think that mixing conditioner with baking soda would actually yield any change but when I have time on my hands (hopefully next week), I will try...Thanks for the link! I too have done and had good results with the baking soda treatments. I used conditioner also (equal parts) my baking soda wash Arm & Hammer. I have done Little Lambs version but have my own also on my blog under the baking soda label. How neat! And how smart of you to test it on shed hair. I would be too afraid to do it my own head after hearing some horror stories. I've done the baking soda treatment before and I agree that it's just a really good deep conditioner. I think that certain ingredients tend to affect certain types of hair and for whatever reason baking soda tends to make my hair much smoother, almost frizz free and easy to detangle. It's the same texture, just a little easier to work with. Finally, it's NOT permanent, which is one of the key characteristics of a true relaxer. I believe the point is *The INTERACTION* between the baking soda and moisture with your hair.. therefore you would have to do the experiment in that way. As I understand it, the Baking soda treatment is used to open the cuticles, especially helpful for girls with low porosity hair (not ideal if you have high porosity from a relaxer, dye, or naturally). Natural girls who use it claim that it opens the tight cuticles to allow moisture to open. Seems that it has a cumulative effect where you may not see the result the first time, but only after a few washes.